Trump could force change, but the question is: What kind? 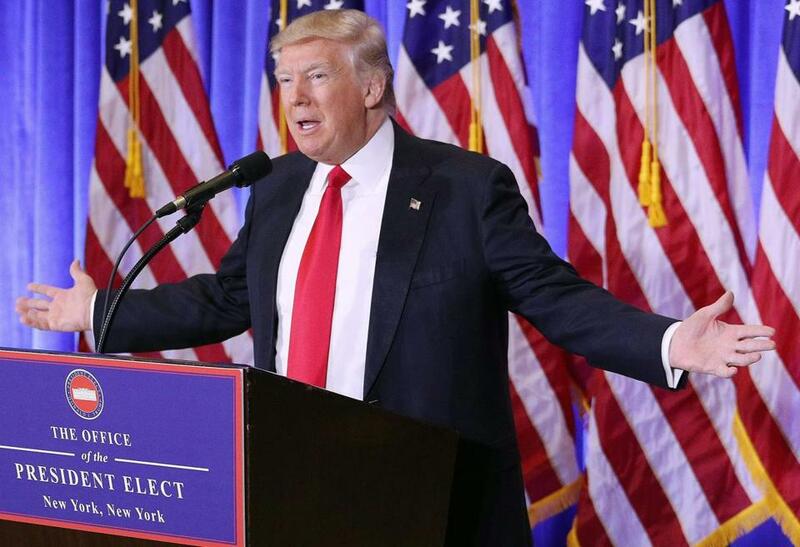 President-elect Donald Trump spoke Wednesday at his first news conference in nearly six months. WASHINGTON — Outwardly, at least, the weight of his new position has scarcely affected Donald Trump, who just in the last week tweeted with abandon, likened US spy agencies to Nazi Germany, and openly discussed his own germaphobia. Imagine all that happening from the Rose Garden. Americans often vote for “change” candidates but the weight of Washington norms usually stifles radical shifts. Trump appears intent on being an exception to that rule, bringing change, both in terms of policy and style; the presidency has never seen anyone quite like him. On Friday at noon, he will begin placing the imprint of his dramatic, combative, proudly unapologetic persona — literally and figuratively — on the 228-year-old office. There are open questions as to whether Trump will conform to the trappings of Washington, or whether he will fundamentally change them. His transition has showed some signs of both. And Obama, who also promised a transformational presidency, showed how difficult it is to alter the ways of Washington where many forces, political and commercial, exalt and profit from the status quo. Obama is intellectual, patient, outwardly calm. Trump is none of those things. And the job of president entails so much more than defending against terror attacks, mastering the intricacies of foreign policy, and besting the confounding barriers to legislating. There are the hundreds of state dinners, meetings with foreign leaders, awards ceremonies, Marine band performances. Under Trump, will anything, even the annual pardon of the Thanksgiving turkey, ever be the same? From minor details (like not including clam chowder from Legal Sea Foods on the inaugural menu) to monumental ones (whether to engage in open warfare with the intelligence agencies advising him), Trump already seems prepared to toss aside the customs of a city whose idea of exotic is a Brooks Brothers polka-dot tie. Trump’s campaign was often run seat-of-the-pants style, with everything revolving around one man and his Twitter account. The executive branch has layers designed to make the decision-making process deliberative. Congress typically operates, if it does at all, at the pace of a snail. The pace already seems to have picked up. Even before Trump’s swearing in, Congress has passed a budget resolution that paves the way for repealing Obama’s health care law. Still, Trump’s mandate is limited, and he now is expected to lead in a city voters view as disconnected and corrupt. If he and the billionaires and generals he has picked to run his government do not deliver, American patience may soon wear thin. Not only did Trump not win the popular vote, but recent surveys show that he is not well liked, especially by the standards of newly elected presidents. In January 2009, 83 percent of those surveyed approved of Obama’s handling of the transition, according to Gallup. Their recent poll found that only 44 percent approve of Trump’s efforts so far. Trump could soon find out just how resistant Washington can be to change. President Jimmy Carter wore a sweater on television and was lampooned. Ronald Reagan came into office vowing to abolish the energy and education departments; not only did those things not happen, but he added another federal agency: Veterans Affairs. Some have tried to end the homely tradition of pardoning a turkey, only to back down after being inundated with opposition from the poultry industry. “If you can’t get rid of something like that, what can you get rid of?” said Martha Joynt Kumar, a presidential historian and director of the White House Transition Project. The White House still has full-time calligraphers on staff, writing out invitations to heads of state or sketching out menus for state dinners. Almost every week since 1982, the president has sat down on Fridays to record a weekly radio address. Still, in theory Trump could change quite a bit, including how the country’s best-known building looks. He has criticized the fact that it doesn’t have a large ballroom (and in 2010 offered to build a “beautiful” new one in the White House). Those who have worked in the building concede it could stand some renovation. While the political appointees all leave during the changeover of administrations, about 30 percent of the White House staff remains. “They’re the institutional memory and operation,” Kumar said. Each president brings his own style, of course. Ronald Reagan almost never took his jacket off while in the Oval Office, out of reverence for the space and his powerful position. John F. Kennedy allowed his children to play in the room, as captured in iconic photographs. Trump’s transition team did not respond to requests for comment, but Trump himself has talked about trying to do things differently. Trump’s protocol-be-damned call with the president of Taiwan in early December sent the world aflutter, upending foreign policy norms in the United States and angering China. Many will be looking toward Trump’s decision about which country to travel to first as president, and which foreign leader to invite to the United States. Still, there is a larger question at play: How much will Trump himself change after he takes the oath of office? Will joining the long line of presidents humble him or temper his style or only reinforce his well-honed self-regard?